Haiti Cultural Exchange is a nonprofit organization established to develop, present and promote the cultural expressions of the Haitian people. We seek to raise awareness of social issues and foster cultural understanding and appreciation through programs in the arts, education and public affairs. The Haitian Diaspora in New York City is an immigrant group that has continued to create new forms of cultural expression, but has not experienced equitable access to vital resources and networks. 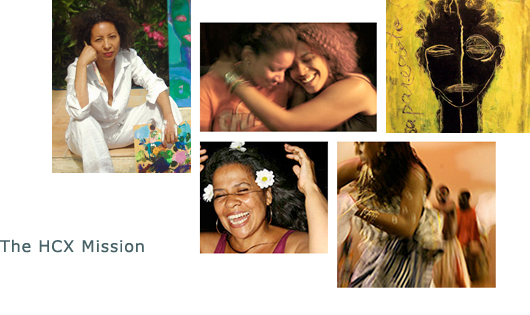 In 2009, seven Haitian-American women banded together in response to a lack of consistent support and visibility for cultural offerings produced for and by this community. The result was the founding of Haiti Cultural Exchange, which fosters a permanent presence for Haitian Arts & Culture in our city. Our programs and services seek to support emerging and established artists, promote cross-cultural exchanges, preserve our cultural heritage, and encourage dialogue around contemporary social issues. Through Arts Presentation, Cultural Engagement, and Artist Development programs, HCX has provided high caliber arts programming to over 45,000 individuals and has presented over 350 artists. Our Arts Presentation programs provide diverse platforms for Haitian and Haitian-American artists to showcase their work, including two major festivals: Haiti Film Fest, an international festival of Haitian and Haitian Diaspora cinema, and Selebrasyon!, a multi-disciplinary celebration of the best of Haitian performing and visual arts. Our Cultural Engagement offerings instill understanding and knowledge of Haiti and its people. These programs include An n’ Pale, our yearlong conversation series, and Ti Atis, an in-school arts education program for Brooklyn youth. Our Artist Development activities connect Haitian and Haitian Diaspora artists with further exposure, resources, and economic opportunity. Through referrals, HCX continues to make connections between organizations & individuals seeking talent and Haitian artists. Part of the way we do this is through in-school performances & workshops where artists can participate in special assemblies and in-class performances, in NYC, that work to expand students’ world eye view and connect them with their Haitian heritage. For more information on how HCX can connect you or your organization with Haitian artists of various disciplines, and for hosting a workshop/assembly please contact Régine at regine@haiticulturalx.org. HCX is committed to engaging individuals and institutions in our community around Haitian culture. The HCX Community Page functions as our blog platform to exchange information about HCX events, opportunities, and related organizational information. These organizations provide a wealth of information on Haitian culture, the arts and social issues of importance to our community.